Community Census was conceived of as a collaborative project between TYTHEdesign and 3×3 Design, two Brooklyn-based social innovation firms interested in enhancing traditional means of data collection to build community engagement and create positive social impact. In our everyday work, we support organizations that are working to better connect with their communities. We know how difficult it can be to collect useable information, transform data into action, and maintain momentum after your event has packed up. 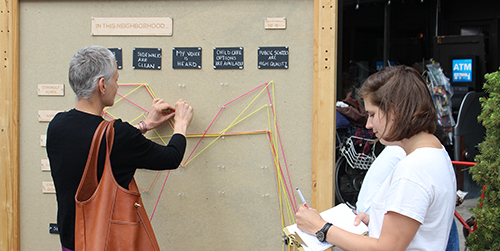 Drawing on our experiences and backgrounds in design thinking, urban planning, and community development, Community Census was created to explore nuanced perceptions while bringing a fresh approach to data collection. 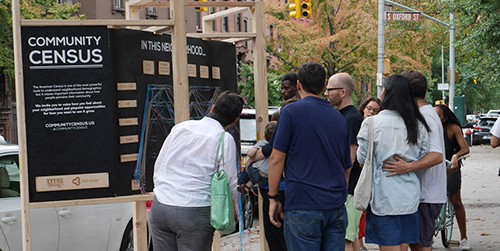 In Summer 2015, TYTHEdesign and 3×3 Design teamed up with local partners to prototype Community Census in diverse neighborhoods across New York City. Using a built structure, we explored how participation might vary based on event type, questions asked, information gathered, and location. And we learned a lot! Since then, our collaborative team has been refining the model for easy and effective use in your community. TYTHEdesign is a capacity-building firm that uses the lens of design and strategy to help non-profits, social ventures, community-based organizations, and city governments do what they do best, even better. We analyze challenges from a variety of angles and develop creative solutions for and with each community. 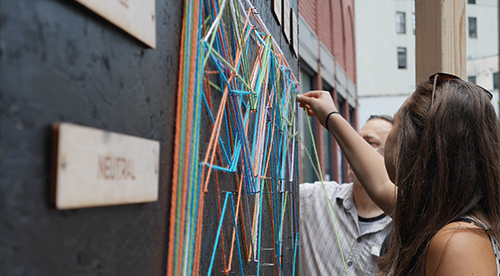 3×3 Design is social innovation consultancy that works at the intersection of urban planning, design, and technology. We create smarter programs and services for more livable cities. Our human-centered process helps organizations focus on their audiences’ needs to build successful and scalable solutions.